Did you know that you can associate up to 1,000 sites to your YouTube account? This includes news and mobile sites. This means you can link a video to any site that you own on your YouTube account. Most YouTubers think you can only associate one website with your YouTube account. After associating one website you can add more associated websites via Webmaster tools. When you want to link to an external website, annotations will just look at Webmaster Tools to see if the domain is allowed. 1. If you don’t see the associated website option that means that your YouTube account may not be verified or that your associated website may not be verified. can be used across multiple channels on that account. by enabling webmaster tools via the blogger dashboard. 4. You can use YouTube Cards to link your video to an associated website. 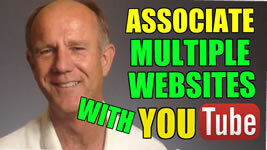 Now you know how to associate multiple websites with your YouTube account.